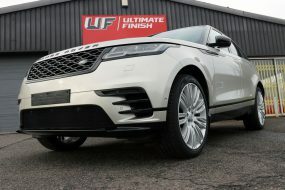 UF has long advocated protection treatments for new vehicles, on the basis that, suitably protected, a car will retain its ‘as new’ appearance for longer. 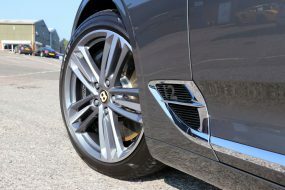 When it comes to reselling a vehicle, it’s well documented that one with a superior cosmetic appearance will always command a premium – regardless of whether the mechanics are equally as sound. With the used car market being so competitive, more and more dealers are realising the benefits that professional preparation can bring. 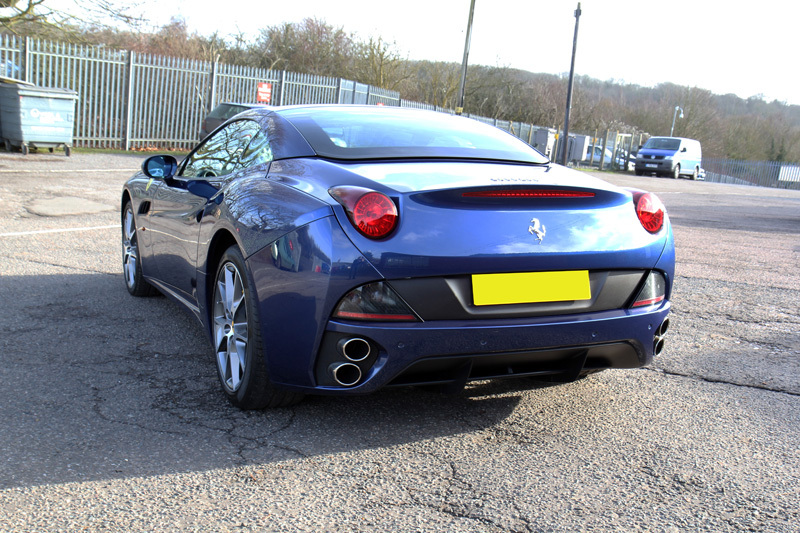 So it was for an independent Ferrari specialist with a stunning 2011 Ferrari California 2 + 2. The California was first featured at the 2008 Paris Motor Show. A grand tourer designed by Pininfarina, the 2-door hard top convertible caused quite a stir. 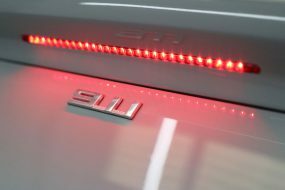 It was the first time Ferrari had offered a direct petrol injection V8 engine situated at the front of the car, the first time Ferrari had featured a seven-speed dual-clutch gearbox and the first one to have a retractable hard top that actually folded away, electrically, into the boot of the car. It is perhaps, the more ‘luxury’ option from Ferrari, rather than previous models which to some extent have retained more of their racing roots. However, with a 0-60mph of 3.8 seconds, the California is no slouch! 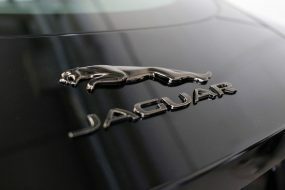 So, offering comfort and luxury as well as performance, Ferrari had entered a new market. 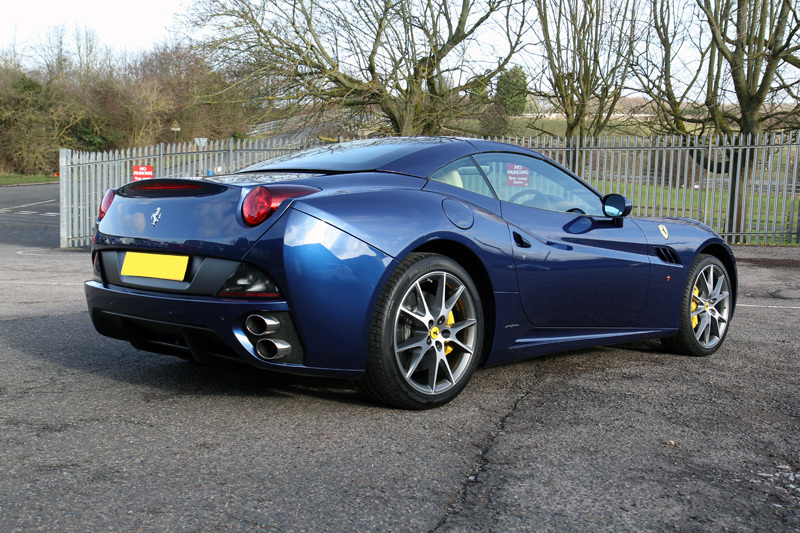 Although this low mileage California was mechanically sound with an impeccable service history, the dealer wanted to ensure both the Tour De France blue paintwork and the Crema hide were equally as impressive before presenting the vehicle for sale. 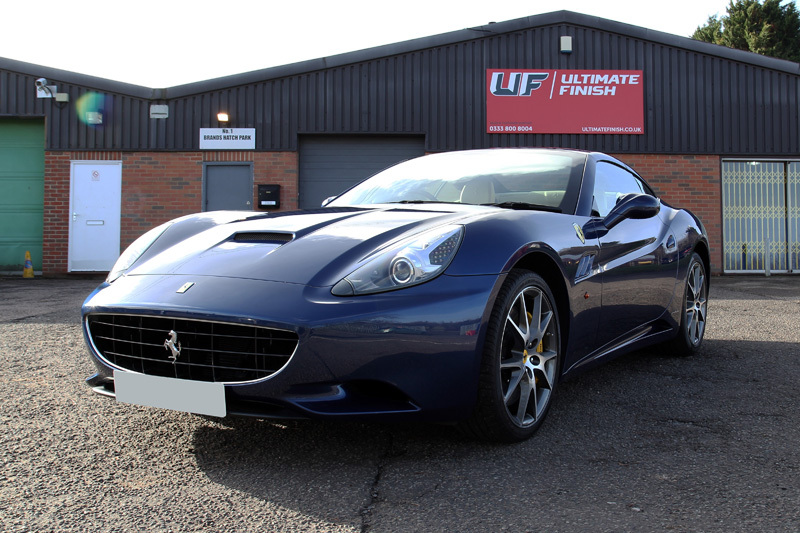 Following a vehicle appraisal at UF’s Brands Hatch studio, it was decided to complete a Gloss Enhancement to restore the paint to its former glory and Leather Protection Treatment to deep clean and protect the Crema interior. Prior to these works being started, the California required careful cleaning and thorough decontamination using non-contact methods to ensure the integrity of the clear coat was preserved. Bilt-Hamber Korrosol was sprayed onto the bodywork and wheels and allowed to dwell. This neutralises iron particles which are tiny, sharp, corrosive and on dark paintwork, difficult to spot. The bodywork and wheels were then degreased using a solution of Gtechniq W5 Citrus All Purpose Cleaner. This removes any diesel or petrol contamination that may have left an oily residue. 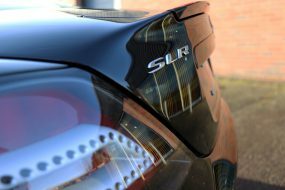 Areas such as the petrol cap, bonnet, boot and door shuts were also cleaned with this solution, agitated with a detail brush to ensure the crevices and creases were thoroughly clean. 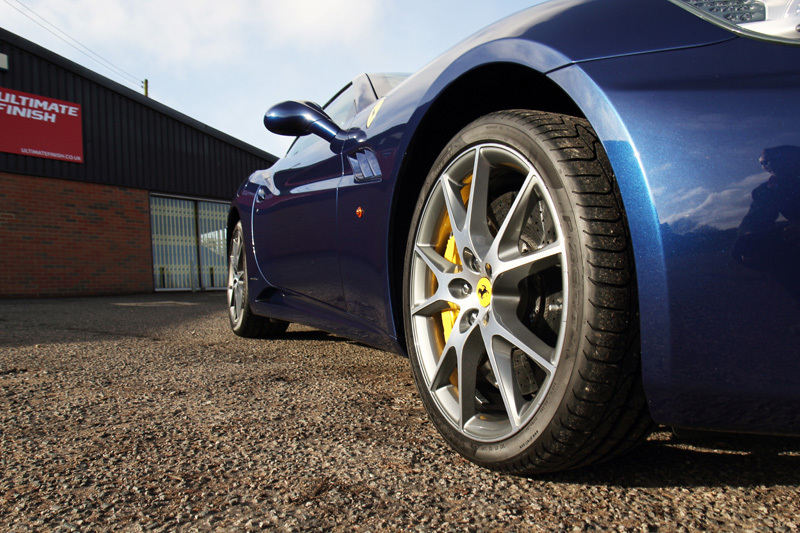 Each corner of the California was raised on a trolley jack to allow the wheel arches to be completely cleaned. Wheel Woolies allowed the rims to be cleaned right to the back to ensure they were completely dirt free. 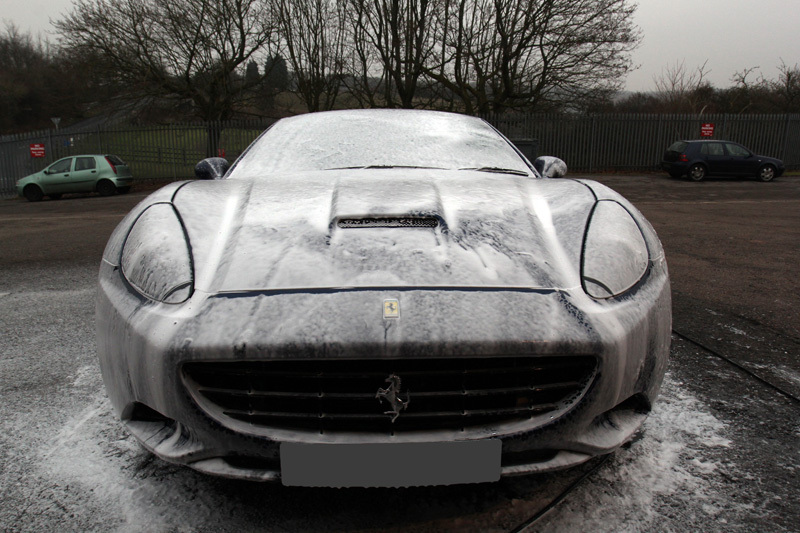 Finally, the California was pre-cleaned using Ultimate Snow Foam to remove any remaining larger particles of dirt and grit, again, to prevent contact with the paintwork whilst ensuring as much contamination as possible had been removed. Once this had been completed, the car was washed using the Two Bucket Method, an Ulti-Mitt Double Sided Merino Wash Mitt and Nanolex Pure Shampoo. This method separates wash water from rinse water and uses Grit Guards placed in the bottom of the buckets to remove contamination washed off the vehicle. The mitt brushes over the Grit Guard in the Rinse Bucket, dirt settles to the bottom, the mitt then is wrung out and then reloaded using clean soapy water from the Wash Bucket. After rinsing the shampoo suds away, an Aqua Gleam De-ionising Water Filter was attached in-line with the hose to give the California a final, pure water rinse. It was dried using soft microfibre drying towels, brought into the studio and raised on a hydraulic ramp. The paintwork was inspected under high-intensity lighting to check for signs of damage. 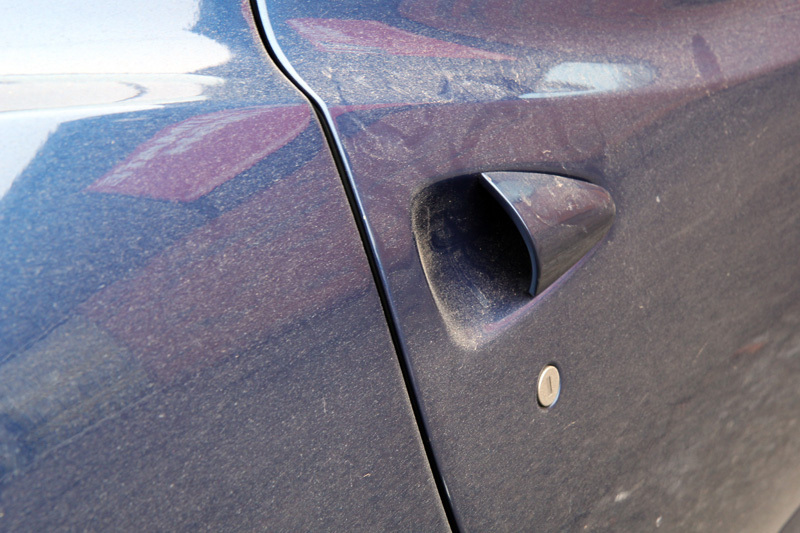 The paintwork was in reasonably good condition, but time, the environment and lack of protection had resulted in inevitable swirl marks and a general lack of clarity. 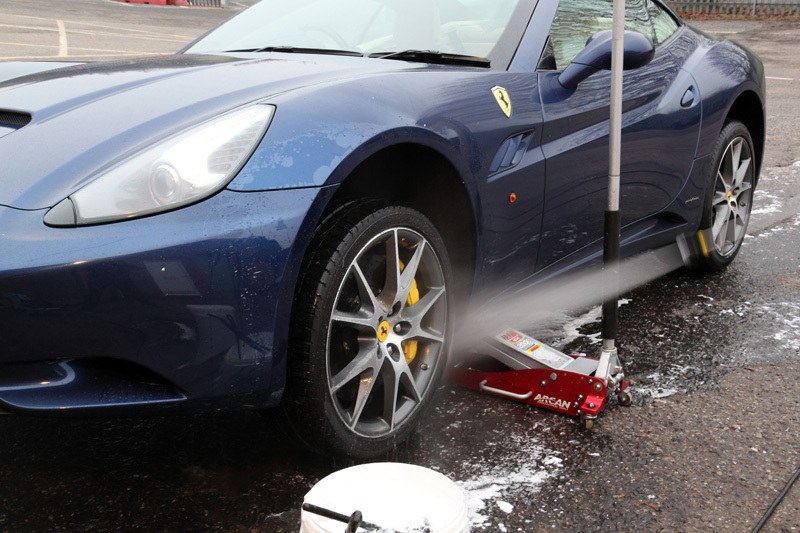 To remove the paintwork blemishes in order to achieve the maximum colour depth and shine, the California was machine polished using a RUPES BigFoot LHR 15ES Random Orbital Polisher. A Kamikaze Collection Banzai Dynamics Red Polishing Pad was selected with Menzerna Super Finish Plus 3500. This fine finishing polish combined with the Dot Point Polishing (DPP) technology employed by the Banzai Dynamics Pad delivered enough cut to remove the damage and left a high gloss finish ready for sealing. 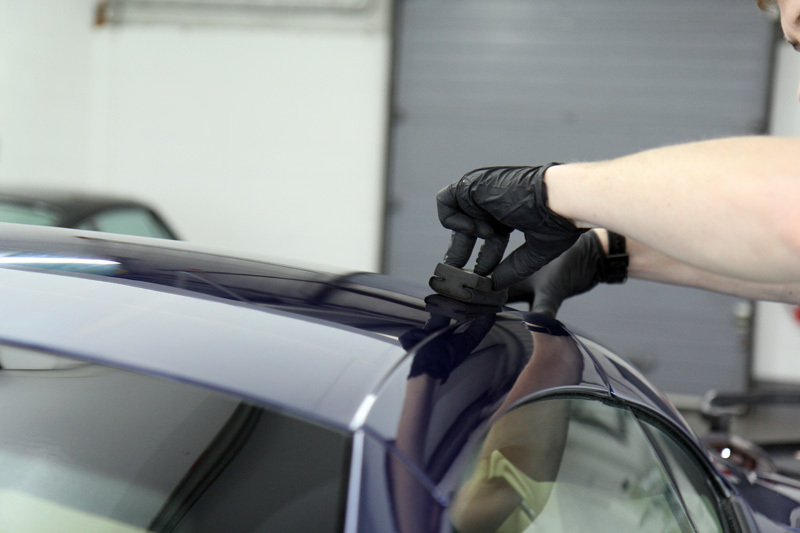 With the paintwork refined, Nanolex EX Residue Remover was misted onto each panel and buffed off with an ultra-soft seamless microfibre to ensure all traces of polish residue were removed. To protect the finish, Kamikaze Collection ISM PRO was applied by hand. Using next generation technology, ISM PRO combines high quality, German-sourced elements with ultra-low molecular weight hydrocarbon ingredients to produce a coating with extreme water repelling properties and stunning optically clear high-gloss levels. 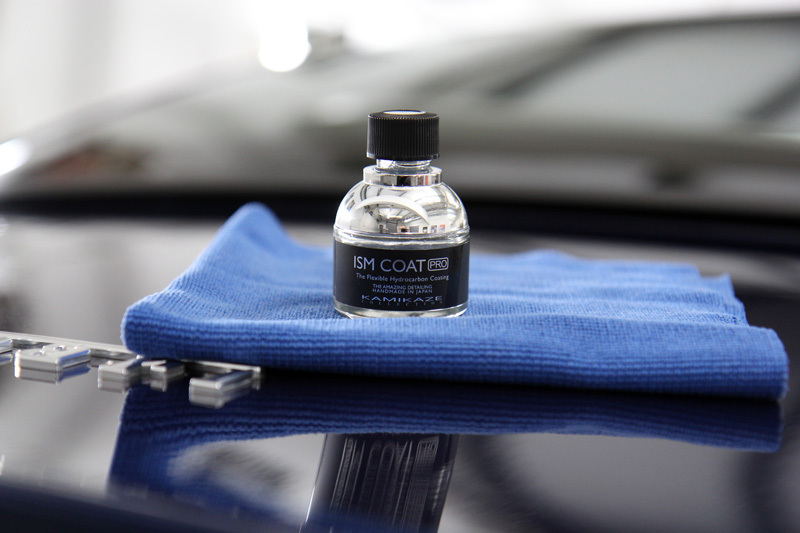 Available only to Kamikaze Collection accredited detailers, the application process for this nano-ceramic coating must be precisely followed in order to attain the highest levels of performance. 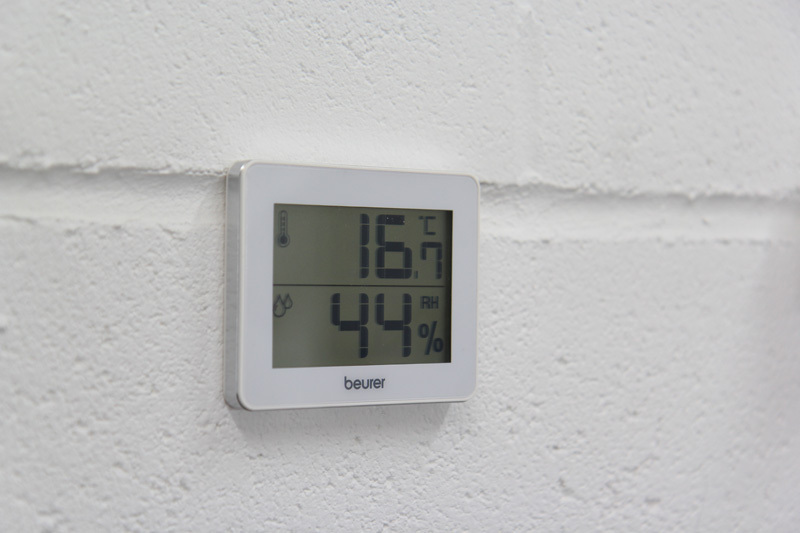 In addition, the ambient environment must be carefully controlled, with temperature and humidity within acceptable parameters. With the exterior protected, attention turned to the interior which was in need of deep cleaning followed by a protective coating. Colourlock is a market leading manufacturer of specialist automotive leather cleaning, leather repair and leather protection products. 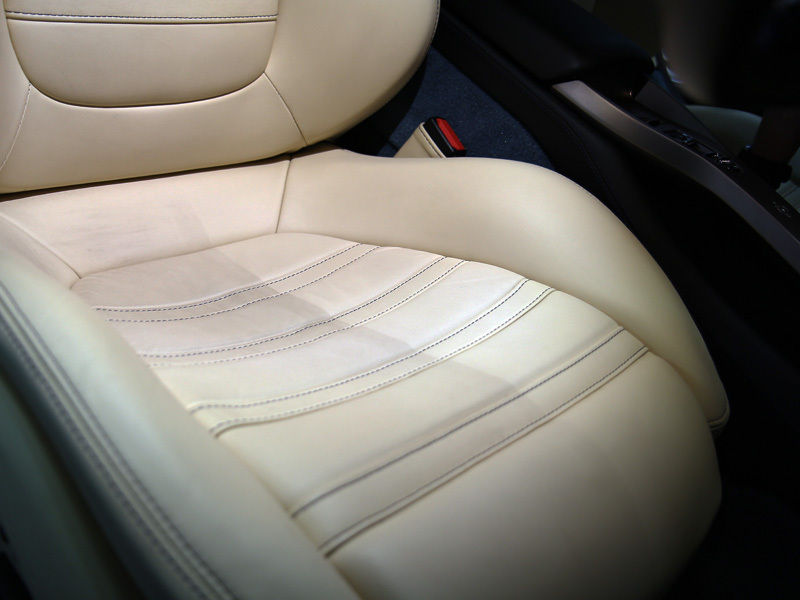 The Crema leather interior was cleaned using Colourlock Mild Leather Cleaner and a Leather Cleaning Brush to ensure the cleaner worked into the leather grain, lifting out the embedded grime. After removing the residue with a clean microfibre, the leather was protected with Colourlock Leather Shield. This lays down a protective coating, helping to prevent UV fade, dye transfer and general wear and tear. 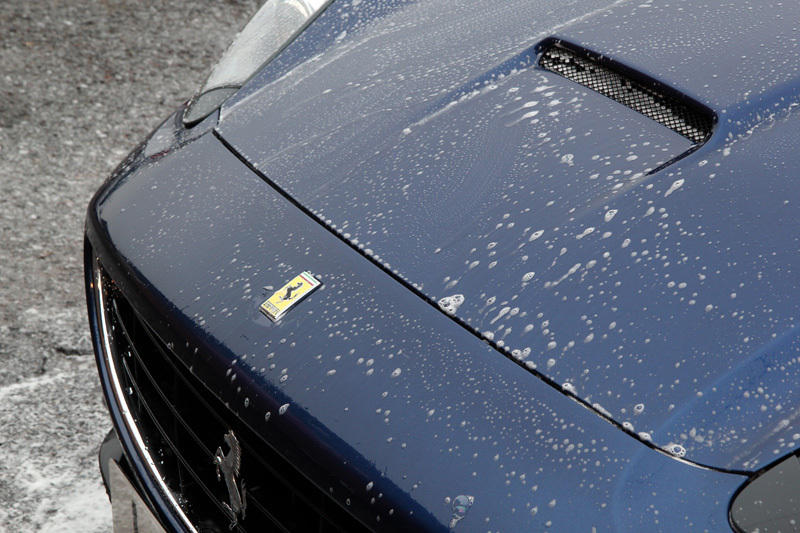 After hours of fastidious preparation and now in a condition commensurate with this iconic marque, the Ferrari California was ready for sale and ultimately its next lucky owner!